John Scullion from the Prison Officers Association says, "Jail terms of prisoners convicted of assaulting guards are rarely extended, as most are given concurrent sentences". In an article in the ABC news Wed, 17 April 02 "It may require special legislation, so an approach is being made to Attorney-General Bob Debus to see if it requires legislation and if so, can they do it?" he said. The Carr Government went further as saboteurs. Carr rallied Whelan, Costa, Debus and now Richard Amery ex policeman as Minister of Corrective Services to succeed the coat hanger into black. "We do Gods work when God forgets say the police." blue shirts? Or black shirts? Carr's labor caucus drags Ron Woodham in as Commissioner of Corrective Services a person with a very bad history of corruption i.e. : bashing prisoners on behalf of the government and getting off because why? You guessed it. The Government rolled the legal system. Woodham couldn't take responsibility for the governments directives. Debus secures Attorney General with a history of discrepancies within his previous portfolio as Prisons Minister to help draft the legislation into the black. Woodham, Carr's prisons bend over the line man just like Clive Small the police bend over the line man gets the job done corruptly. 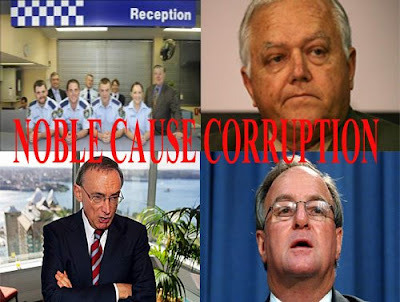 The importance of the Separation of Powers Doctrine is just as important between the Police Service and the Department of Corrective Services. To highlight this fact then perhaps we need to change the colours of their shirts. Black is contaminated Blue is Police what colour would you like to see Prison Officer's dressed in? When people go missing between the police and the prison services. When there are riots or prisoners and prison officers are being bashed. When deaths in custody rise or when high profile prisoners suddenly die in special circumstances after they are released and have served their time then Satin is in on it doing Gods so called work.